Day Fifteen of The Great Rattler Run – Northern Half of The Old Telegraph Track to Loyalty Beach, Last Stop Before The Tip of Cape York!!!!! If one was just to look at the kilometres alone, you would think the journey was almost over. When we woke up, we were only one sleep away from making it to the end of our journey. But that was the furtherest thing from our minds when we packed up the camp gear and hit The Old Telegraph Track again. First up it was all business, changing the oil in The Rattler, after it had been inundated with water the previous afternoon. But before we drove off there was a quick bush walk down to Twin/Elliot Falls, which we could hear bubbling away through the night from our camp site. It was early in the morning and the mist was floating over the crystal water that weaved its way through the rock crevices before cascading over the edge of the falls. But there was little time to waste, and after soaking it all in in double time, we were back on a mission to conquer the OTT! The first crossing of the day was only minutes away from camp. Canal Creek, a shallow water crossing with deep eroded banks was a walk in the park for The Rattler. Starting in about 5 kms, there were 4 water crossings in a row, separated by only a few kms. Now we were talking! There was some real water to go with the crossings! Though nowhere near enough to prove at all challenging for any of our vehicles, including The Rattler! The red dirt had mostly disappeared along with those dry creek beds, and we were now seeing mostly sandy creek beds and white clay like substrate on the banks. When we reached Sam Creek, we avoided the deep hole sitting at the entry point and drove along the well worn, but deeply eroded bank to a shallower crossing. The Fuso went first, twisting the wheel base which creaked and as it was stretched to the point where one of the front wheels lost contact with the ground. After a few back and forwards, The Fuso powered over the rough terain and shot to the other side of the Creek. Now it was time for The Rattler! The old girl rode those gullies better than a Monster Truck on steroids. Don was at the wheel and I was up the front just marvelling at the sight of my beloved Rattler taking on The Track today, just as she would have back when she was a little girl! Next up was Cypress Creek, a narrow creek with a makeshift log bridge, resembling something you made as a kid to get your go-cart across the water. We were planning on taking all 3 vehicles across, including the fully loaded Fuso weighing 4.41 tonnes! The Rattler and Landcruiser drove across no worries. Now it was time for the truck! Seeing as my attempt to spray Shaneen with water failed miserably, I decided to put her in the Fuso and film the trip. I can only imagine the ear bleeding poor Trevor would have copped as she squealed her way over the bridge holding on for dear life! But of course, as predicted, The Fuso took on the bridge and won! If we had time, we would have erected a sign saying ‘Gross weight 4.41 tonne’! There were no crossings for the next 15 kms, until we reached Bridge Creek. This crossing was fairly wide, and was littered with deep sandy holes, some of them very soft. The Fuso took the road to the right and hugged the bank as it effortlessly motored along. The Rattler followed the route alongside our human markers standing next to the deeper holes and also motored through like a pro. Meanwhile I sat up on the banks in the Landcruiser with Karise Eden belting out a tune, building up the courage to complete my mission and give the camera lady some action to shoot! Mission accomplished! The last water crossing on The Track was soon to follow. My mate Trevor who has been expertly driving The Fuso came through here 2 years ago when the water levels were much higher than they are now. He tells me that Nolan’s Brook claimed 47 vehicles that season. I can tell you that this is not hard to believe, as he showed us where the waterline sat back then. The eroded banks also tell the same story, including the large tree that sat on a 45 degree angle over the crossing, with the large root ball exposed. We chose our entries carefully, according to the capabilities of each vehicle. The Fuso was high enough to handle a steep bank with a big deep hole at point of entry. The Rattler and Landcruiser wove their way down a steep entry and took a left turn half way down to another track leading into the water. 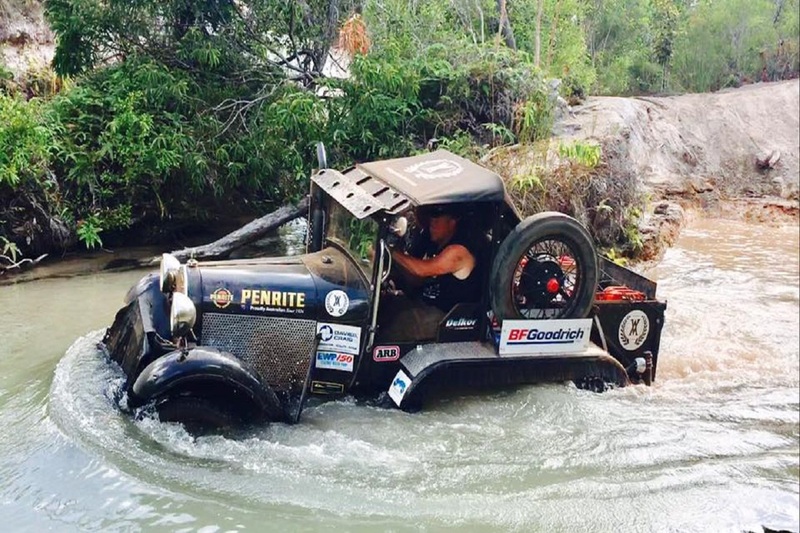 This would be the last time The Rattler would take on a water crossing before exiting The Old Telegraph Track. And, in a few moments, it was done and dusted! Before too long, the Track leading to the Development Road was on our left. This would be the end of our journey on The OTT, another milestone reached on our way to The Tip of Cape York. I was full of mixed emotions, but without any time to mull over it, as we still had to get through the exit track, some of which was on fire as we drove it, up to the Jardine River Ferry and through to Loyalty Beach. But as I sat on the ferry for the brief crossing, I couldn’t help but feel a little disappointed that The OTT was less challenging than expected. Did I underestimate the capabilities of The Rattler or should I just put it down to the meticulous preparation and my dream crew? I’ll let you know after I take it on some time down the track in the wet season! Yep, you heard me! I’ll be back! The mood was a little sombre as we passed through Bamaga and pulled in to our beach house at the Loyalty Beach campgrounds. We had the most beautiful views out over the ocean, but it may as well have been a painting, as those crocodiles weren’t gonna sample any of our delights. I guess it just hit us that by this time the next day we would be home from The Tip of Cape York, and making preparations to take the old girl back home and say goodbye to each other. But it didn’t take too long for the crew to sit back and relax with a few very well earned coldies, and once again fill the air with banter and stories of newly created memories as we watched the sun setting in the distance. Heading for home now with The Rattler on the trailer since Bramwell. Drove all the way from Loyalty Beach to Lakeland yesterday. With the extra weight on the trailer and after taking it over such a long distance on the dirt roads, the trailer needs to be in tip top shape to carry our precious cargo back home. A routine check this morning revealed that the washers on the trailer bearings were loose in the hub and we had to space them with a different size washer to tighten them up to create pre-load bearing. As an added bonus, the change fuel filter light came on in the Landcruiser when we were driving back to Lakeland. So, this morning, we were on a mission to find someone to help us out at the closest town, Mareeba, about 170 kms and 2 hours away. We pulled into town and the local servo recommended Allen’s 4×4 Accessories (Allen’s 4×4, Signs, Tint & Bug Deflectors) the local ARB 4×4 Accessories distributor. Bonus! They had a tricked out workshop and installed the Toyota fuel filter in no time flat. Thanks guys! It is a real pleasure to deal with professionals that go out of their way to help a traveller out as quick as they can without any complaints whatsoever! While Allen’s were taking care of The Landcruiser, the boys were off trying to source the correct size washer. They couldn’t find the correct size, and the local machine shop couldn’t take care of it until after lunch! Being Melbourne Cup Day, I was a little concerned that that might be tomorrow! So Mark and Don set about machining our own with the angle grinder and in another 30 minutes or so the job was done. We are now on our way, currently headed for Innisfail, taking in the beautiful scenery and lush rolling hills. It’s mighty different to the last few days! Not sure where we will stop for the night. But when I do I’ll post about the final day of The Great Rattler Run and give you a glimpse of the stunning scenery along the way.